Felix the Cat is the oldest recognized mascot in the state of Indiana and graduates of Logansport High School have always taken a lot of pride with the uniqueness that Felix brings to the rich history of LHS. There are a few versions of how this famous feline came to fruition through the years. According to the 1941 Tattler, "In 1926, Coach Cliff Wells presented a little red and black cat to Raymond “Curly” Hupp. Immediately, this stuffed feline was christened, Felix." For several weeks, Felix was held captive in a gym locker. But one evening, when an important game was going badly, Felix was taken from the locker and placed in the center of the floor. The Berries were victorious, and thus Felix became our mascot and the first 'official' basketball mascot in Indiana." Another version that is much more detailed was told by Ralph "Red" Tucker in 1996. Tucker played for Wells and with Hupp. According to this story, the date was March 31, 1926, and sixteen members of the Logansport High School basketball team were on their way to a post season banquet at the Barnes Hotel in downtown Logansport. Accompanied by their coach, Cliff Wells, they were entering the hotel when they spotted a small stuffed cat made of oilcloth in a store window. This replica of Felix the Cat was in Logan’s school colors, red and black, and immediately won the admiration of the team. Coach Wells purchased it right then and there. The cat spent the evening with the team in the Rose Room of the Barnes Hotel for the banquet, which was hosted by Mr. and Mrs. O.L. Harrington. Tucker’s story was validated by Curly Hupp’s daughter, Nancy (Hupp) Wallis of the class of 54’. Felix did not make it onto the floor until the 1926-27 season, Tucker and Hupp’s senior year. After Felix made his first appearance, thanks to Curly, he was often brought to the floor in later games that season by LHS cheer leader Henry “Hank” Muckenfuss. Felix had been replaced six or seven times. The last stuffed Felix figure to be placed out on the floor is now housed in the Cass County Historical Museum. Felix IV was submitted to the Indiana Basketball Hall of Fame Museum in New Castle in 1986, where he is on display today. 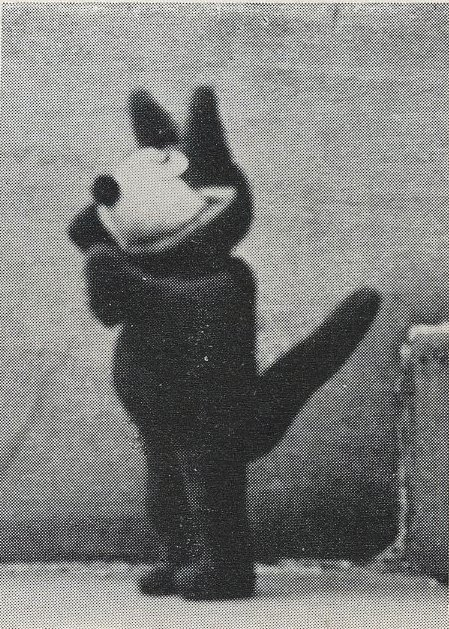 Though still highly revered, the figure has given way to a live version of Felix who interacts with fans, dances on the floor, and enlightens children and adults alike. A community fundraiser was held in 2000-01 to purchase a new Felix costume. The new costume was unveiled to Berry fans during Felix’s 75th Birthday Celebration on Jan. 19, 2001. On Friday, December 16, 2017, Logansport High School celebrated the 90th Birthday of Felix the Cat as the oldest mascot in the state of Indiana. The celebration took place in the Berry Bowl, in conjunction with the girls/boys varsity basketball only double-header vs. Lafayette Jeff. There were activities in the auxiliary gym for children of all ages, and a photograph session with Felix as well. Boomer from the Pacers, Charlie Cardinal from Ball State, Rowdie from the Indianapolis Indians, as well as other high school mascots from around the state, were in attendance for the celebration. 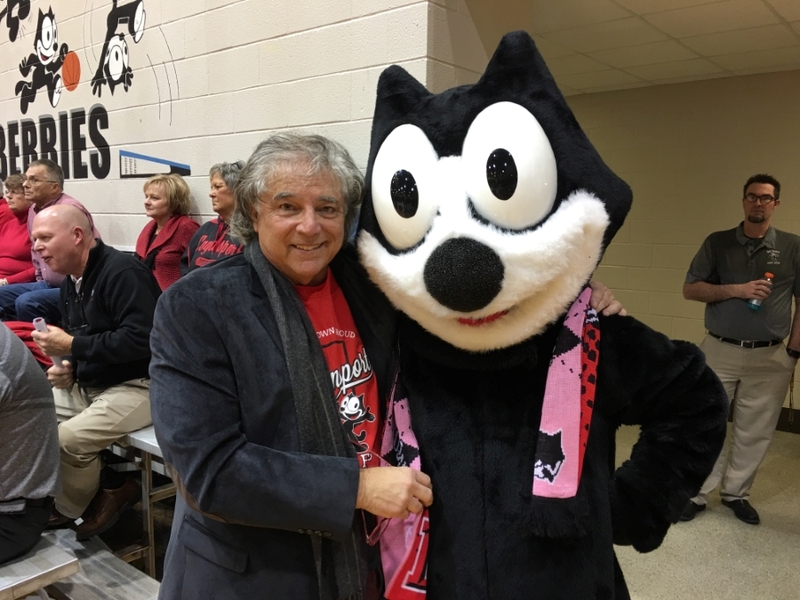 As part of celebrating the 90th Birthday of the Oldest Mascot in the state of Indiana, Felix the Cat, Logansport High School was honored to bring the “Felix the Cat Guy” Don Oriolo, to Logansport. Don is the son of Joe Oriolo, the protégé of Felix creator, Otto Messmer and producer of the 60's Felix tv series, in doing so creating Poindexter and the magic bag. Near the end of his career, Joe Oriolo, recognizing his son Don's imagination and passion for Felix, and his incredible success in the entertainment business, asked Don to bring their beloved Felix into the twenty-first century. Don created Felix the Cat: The Movie (1988), Twisted Tales of Felix the Cat (1996), Felix the Cat Saves Christmas (2004) and Coconut Fred's Fruit Salad Island! (2005) and under Don's watch Felix became the number one licensed character in Asia. Don is a talented producer, composer, artist, musician and he has spent many years in an executive capacity at some of the biggest music publishing companies, as well as being a studio guitar player, avid guitar collector, and owner of Oriolo Guitars. Don has worked alongside musicians and bands such as Gloria Gaynor, Doctor Hook, The Paragons, The Tokens and many more. He also wrote Jon Bon Jovi’s first charted single, a Christmas-themed song entitled “R2D2 We Wish You a Merry Christmas,” Don was also instrumental in launching the careers of iconic musicians Meatloaf, Jim Steinman, and Lisa Lisa and the Cult Jam, to name a few. In 2010, Don Oriolo announced the launch of the Oriolo Guitar Company. Don combined both the love of music and guitars with Felix the Cat. Don's guitar's are played by many famous artist's. One of Don’s guitars was donated in memory of 1975 graduate, Michael Lee Thomas, who played guitar in the Reba McEntire Band. Michael was tragically killed in a plane crash in 1991 along with other band members. The guitar has been a mainstay in lobby of LHS, along with other donated memorabilia. Don did an community event the night before the celebration in the McHale Performing Arts Center. He told all about the history of Felix the Cat’s creator Otto Messmer, Don’s father, Joe Oriolo and much more. In fact, Joe Oriolo created that famous friendly ghost, Casper! Don sang some songs, drew Felix, told stories and much more! The Birthday of Felix the Cat was an officially recognized Indiana Bicentennial event.